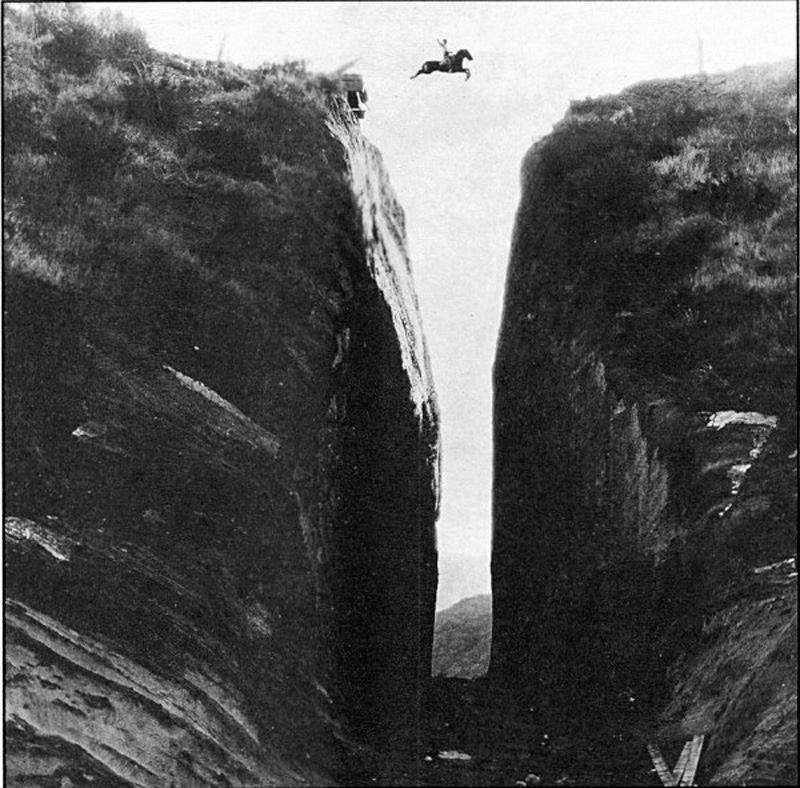 This photo from 1924 supposedly features Tom Mix and his horse, Tony, making the jump at Beale’s Cut — 20 feet wide and 90 feet deep — for the movie Three Jumps Ahead. 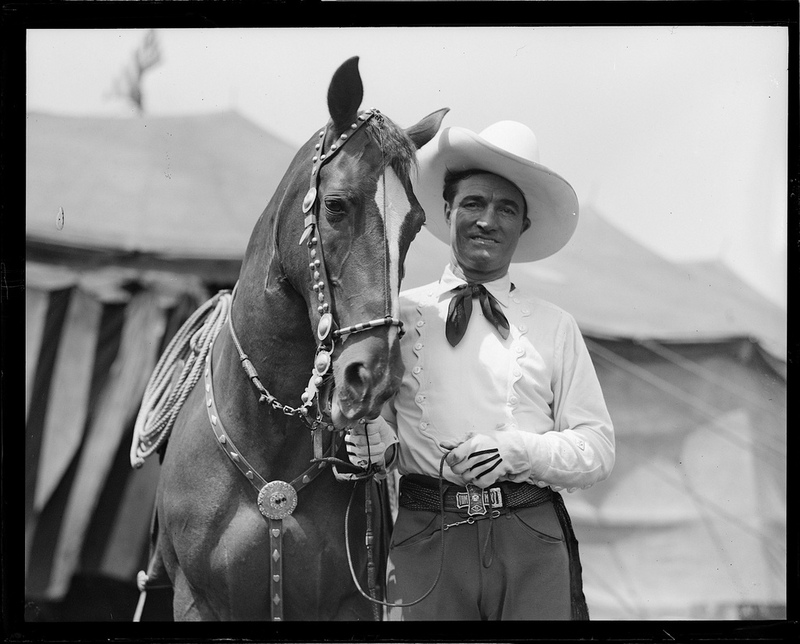 Tom Mix and his most famous horse, Tony. performing his own daredevil stunts. His most famous horse was Tony the Wonder Horse. 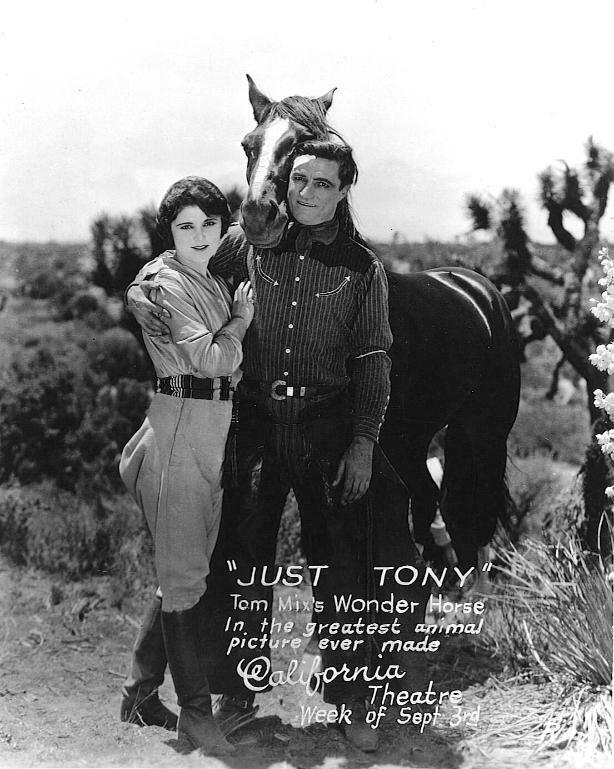 Tom’s most famous horse was Tony, who trusted Tom to do any stunt. Reportedly, Tom would talk to Tony and explain each stunt ahead of time, and then they would just do it. The photo above was used in the publicity stills for the movie Three Jumps Ahead. While the final film has been lost, several stills of the jump are owned by collectors. The big question — even at the time — was whether the jump was really performed and, if so, if it was done by Mix or one another stunt actor. Certainly, contemporary interviews believe it happened, although it was questioned. “In his latest story of the western plains, Mix mounted, leaps a canyon 20 feet wide and 90 feet deep, undoubtedly the longest and most daring leap ever performed by a screen star.” The Palladium, Benton Harbor, MI, 7/7/1923. “And the crashing climax – Tony’s very remarkable jump across a yawning abyss with Tom Mix on his back – is startling in its realism. There’s no fake to this scene. No possible way it could be faked. And besides, faking scenes is beneath the dignity of Tom and Tony.” The Democrat, Washington, IN, 6/5/1923. “This is the picture that caused the accident insurance people to cancel all the policies of the redoubtable cowboy when they learned of the stunts he had mapped out to put into the creation. The horse Tony was assigned also a part that simple stood out by itself. The jump of the horse and rider of a yawning chasm has never been equalled in the realms of picture making. It was this stunt which even the Fox people thought too daring for Mix, which caused the cowboy and his insurance people to part company: Three Jumps Ahead is simply the last word in action.” Arizona Republican, Phoenix, AZ, 5/6/1923. There were rumors that it was one of several stuntmen: Ed Stimpson or Richard Talmadge (who at one point claimed to have made the jump riding a horse named Ranger) or Andy Jauregui. There were even rumors that a stuntman died attempting the jump . . . or that there was no jump at all — that Mix and Tony rode across a bridge that was removed from the print (although that would not have resulted in the appearance of a jump). Another source claimed that several riders performed the jump over many days to get the right shots. My feeling is the jump was probably real. Back then, stunts were a lot more dangerous than they are today (and remember those diving horses in Atlantic City?). Certainly to ask your horse to take that kind of leap requires a great deal of faith and a horse with some real jumping talent. OMG. I don’t know if I should be amazed or sick to my stomach. I can’t fathom such a jump. It’s so incredibly dangerous, risking the life of horse and rider for no good reason … I’m glad such stunts aren’t done anymore.